The Bureau of Counterpropaganda: Land rights when? 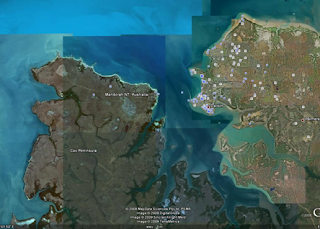 The [Northern] Territory Government and [Larrakia Aboriginal] traditional owners have reached an in-principle agreement over 65,000 hectares of land on the Cox Peninsula, ending the longest-running land claim in Australia's history. The claim was first lodged in 1979.
consolidated claim for entire area lodged by the Northern Land Council. The claim includes various islands and reefs to the west of the Cox Peninsula, Bynoe Harbour, Port Patterson, and the Cox Peninsula itself. This consolidated claim is what became known as the 'Kenbi Land Claim'. The original claimants, 7 named members of the Danggalaba clan, are replaced by 3 groups of Larrakia and Wagaitj people. The first formal Larrakia land rights claim for the Cox Peninsula and adjoining islands dates to 23 September 1976.
the Administrator of the NT makes regulations under the Town Planning Act (NT), which were notified in the Gazette of 29 December 1978. By these regulations the NT Government declares Cox Peninsula a portion of the town of Darwin (the expansion of the town from 142.4 km2 to 4,350 km2 makes it about 3 times the size of Greater London). The townships of Katherine, Tennant Creek and Alice Springs are similarly expanded. Section 3 of the Aboriginal Land Rights (NT) Act excludes 'land within a town' from claims under the Act. The expansion of all the significant population centres in the NT well beyond any possible need provides an inkling of how desperately the NT government and the business interests were to prevent Indigenous people from securing rights to any of their land. When I write, ‘significant’ by the way, I use the term rather loosely – Darwin’s population of about 120,000 is four times that of the next largest town, Alice Springs. Katherine’s population is under 10,000, and Tennant Creek’s about 3000. While Mandora, the nearest point to Darwin on the Cox Peninsula is just a 15 minute ferry ride from Darwin, it’s 138km by road. And after all that, the Larrakia will only be getting 52,000 of their 65,000 hectare claim declared Aboriginal land. Not only that, it’s not over yet, as the Commonwealth Government still has to seal the deal, and who knows how long that will take. I don’t believe it would be the first time a land claim has dragged on so long that none of the claimants live to see it settled. In Canada land claims go on for ever. There has been some militant action - blockading roads etc. in response. In the province of British Colombia a few land claims were finally settled - with the result that some non-natives became quite upset with the large size of the awards of land to the first nations people. This will have the unfortunate political effect of slowing down even further future land claims. Locally, the first nations groups have pulled out a document giving them title to land within 10 miles of the Grand River. Off the top of my head - that includes the city of Cambridge 100k(including land title to the apartment building my wife and I own (for one more day), possibly large sections of Kitchener 300k, Paris 12k, Brantford 85k, St. Jacobs 1.5k, Caledonia 10k (on going battles with first nations over different land claims), Dunville 12k, and who knows what other places. Total population maybe 750,000? I am not aware of any law protecting cities from land claims. One of the problems of land claims is that sometimes the same land is claimed by different native groups. In any case - while particular land in Canada my have conflicting ownership - or even outright warfare over it at the time of colonization (Huron and Iroquois for example) it is safe to say that none of it is European land. Any land that colonizers built on, no matter how obtained, or no matter what its status was, was stolen.